You know that maintaining a business blog is important, but how much time really needs to be spent developing articles? And what are the true objectives of your blog? The important thing to remember is that you want to turn your blog into a community with interaction between your readers and you. Maintain a consistent blogging schedule. In order to maintain your community and encourage readers to sign up for your news feed, a schedule lets people know what to expect and when. Three to four posts per week is ideal, but it does vary by your company's service, product, or industry. Redundancy or information overload is not what you’re going for. Keep yourself on-topic with relevant, timely information, thus making your articles valuable. Ask guest bloggers to contribute. If your blog readership is up and running, and you’re attracting a significant number of daily readers, you can ask members of your community to guest-blog on your site. Getting other perspectives and comments from your community “experts” is very cool and engaging, and you might be able to build a series of posts from other bloggers into your site. If someone asks you a question, be sure to reply. Acknowledge what they said in your reply, and take the time to answer correctly. If you don’t know the exact answer to a question, at least thank them for the comment with assurance that you will post an answer once you have it. Thoughtful responses to questions and comments can do as much to build your community as blog posts can. Be sure to also reply to criticism; this is your chance to clear the air and can even attract readers to other parts of your website. Get involved as much as you would in any offline community group. Everyone loves to get free stuff! If traffic is lagging and needs a boost, try a contest or giveaway to spur more interaction. You can make the contest about almost anything: writing and submitting blog posts, designing fashion templates for a wardrobe website, earning reward points for different levels of activity, etc. Seasonal contests are great, too! Examples: the most romantic date idea on Valentine’s Day or most weight loss following a New Year’s Resolution. 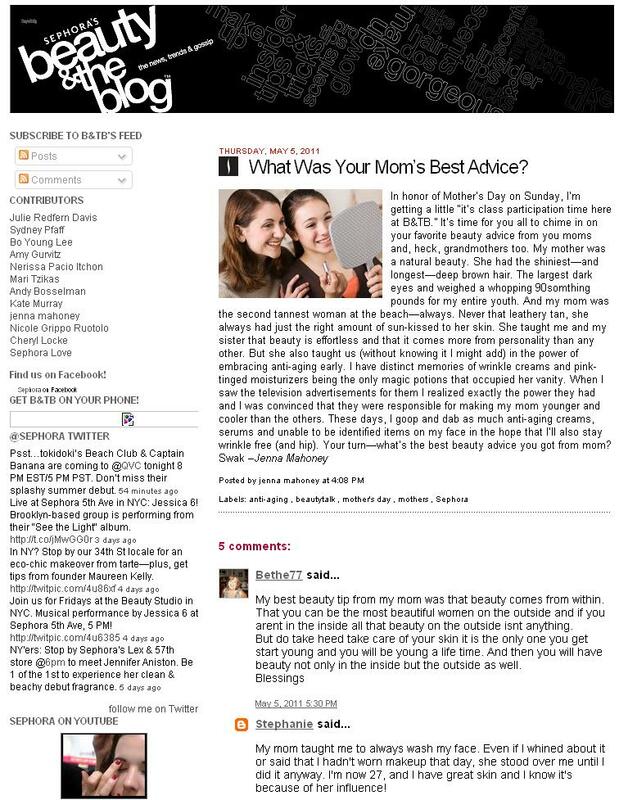 Sephora's blog (seen above) recently asked readers about the best beauty advice their moms ever gave them. The post, in time for Mother's Day, was not only seasonal but may have reminded a few readers to buy last-minute gifts for their moms! One caveat to contests and giveaways: be sure that you understand the legal issues around running contests. Consult with your marketing agency or legal department. Legal requirements can vary state to state. Need to jumpstart your company blog? We can help!